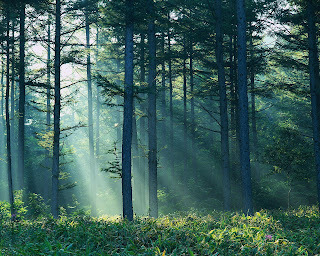 FACT: Forests cover over one third of all land in the United States. FACT: Over 72% of hardwood forests in the United States are privately owned. FACT: Over 70% of forest land that was here in 1600 is still forest…over 737 million acres! FACT: Forests in the US are increasing at an average rate of 5.27 BILLION cubic feet per year AFTER mortality and harvesting! FACT: Harvest has over doubled (102%) since 1952 and we are STILL showing growth in our forests. FACT: Over 1.5 billion trees are planted in the US every year…that’s 4.1 million seedlings per day! FACT: Each year 6 trees are planted for every 1 that is harvested. FACT: 43,700 companies in the US employ 1.75 million workers. FACT: Wood is recyclable, biodegradable and durable, lasting often for centuries and can be returned to the earth at anytime with a benefit to the earth! FACT: Wood is renewable while stone, iron or coal once used is gone forever. FACT: Wood makes up 47% of all industrial raw materials used in the US yet require only 4% of the energy used to produce these materials! FACT: Steel structure materials require 3 times as much energy and 16 times as much clean water to produce then wood. FACT: As an insulator, wood is 16 times more efficient as concrete, 415 times as efficient as steel and over 2000 times as efficient as aluminum! There is also a lot of great info over here about Reforestation and why it is so important, which you may or may not realize. It's good to know that what we are a part of, is good for our environment! If the beauty of your existing hardwood floor is marred by scratches and dents, refinishing could restore its original luster. 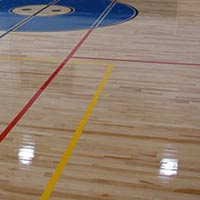 The process requires sanding a thin layer off the top of the floor, staining it again, and applying a new protective finish. 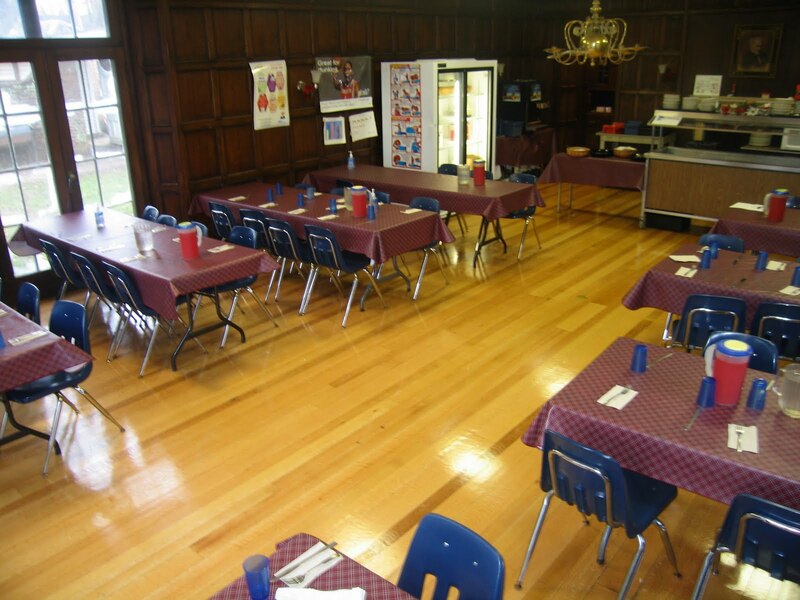 The Applegate refinishing crew is experienced at stripping, sanding, staining, painting, and polyurethane topcoating. If you opt for a natural finish, we'll apply no stain, but one coat of a polyurethane sealer and three coats of polyurethane. 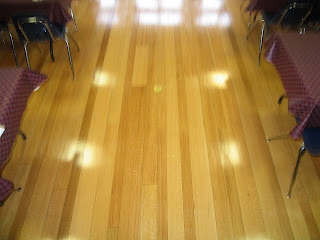 If you'd prefer a stain, we'll apply the stain plus three coats of polyurethane. If you have only minor damage or a dull-looking floor, we might suggest a screen and coat instead of complete refinishing. This method involves only light sanding and one coat of polyurethane. When Should I Think about Refinishing my Wood Floors? Most homeowners will schedule a complete refinish when worn or bare spots begin to appear, or scratching has become too much to handle. 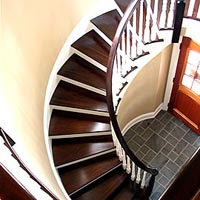 Sometimes the homeowner simply wants a color change when they consider refinishing or some just may want to change the gloss of the finish, or you can also change from a waxed finish to a lower maintenance polyurethane finish. When to have the work done? Simply depends on you . While most people can live with the everyday abuse wood floors get as scratches, dings, and dents lead to adding character, others prefer a sleek contemporary look in which you would require refinishing every five years to maintain. It is all about the homeowner's preference. Some refinishers have invested in dust extraction systems. Others may just have a bag attached to their sanding equipment. Dustless systems eliminate an enormous amount of dust and old finish materials that would otherwise linger in your home for possibly months after refinishing. Dust can find it's way anywhere; into kitchen cabinets, heating and cooling system vents...everywhere unless you protect everything during the work. Dust can be minimized if the refinisher tapes off rooms, you remove drapes, and maybe even call in that cleaning crew once the work is done. Poor dust control may also have an effect on the final appearance, not to mention everyday health. Applegate does offer a highly advanced dustless sanding system that virtually eliminates the wood dust. The filters remove all the dust down to below 1 micron yielding no dust emissions from the system. No plastic sheets or masking is required and there is minimal cleanup. What Happens after the Job is Done? When Can I Move Furniture Back In? Water based finishes will take the least amount of time to dry and cure. Conditions can vary and depends on relative humidity within the home or conditions outside if you want to speed up the odor removal with an open house. We'll let you know when the best time to replace furniture is, as well as when and if you are able to use area rugs. If the rooms are ready with furniture, drapes and any wall hangings removed, finishing will usually take 3 days. 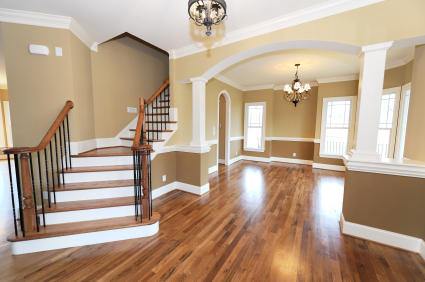 If you'd like to spruce up your floors, Refinishing may be all you need. Call us now for a Free Estimate to see what we can do for you! 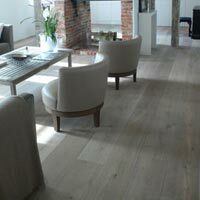 There are several things to keep in mind when selecting a wood floor. By considering the questions below, you can ensure that your purchase will meet your needs and provide years of beauty and durability. We are always available to help you make a great selection. The kind of project you have will dictate the choices available to you. Installation methods and warranties will differ for residential versus commercial or institutional. However, many products are available in both classifications. 2. On what grade (elevation) will the flooring be installed? If you are installing your floor below grade, be sure to use an engineered or laminate product. Solid wood floors normally would not be used below grade because they are not as tolerant of moisture. 3. What subfloor will you be installing on? 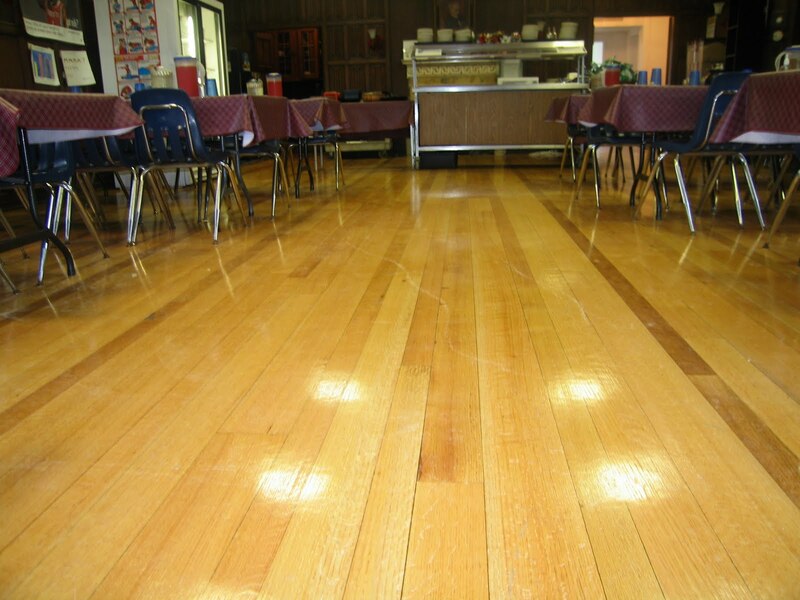 A solid wood floor is not a good choice over a concrete slab since it should be nailed or stapled to the subfloor. Most of time, wood flooring will be installed over a plywood subfloor. Concrete slab is most common in below grade levels, ie basements.What installation method will you use? 4. What installation method will you use? For Glued or Floating installations your best choice is an engineered or laminate floor. You'll get the best results from your flooring if you use the recommended installation method. Solid wood flooring will most often be nailed down. 5. What color tones do you prefer? 6. Do you have a species of wood in mind? Sometimes the species of wood will limit the stain options available to you. To have more options available, consider different types of species. 7. What width of boards do you prefer? Something to consider regarding board widths is the size of the room or space you are installing the wood flooring in. Wide board tend to open up the space more than smaller widths. You will get the best results from your selection if you make an informed and educated decision and use this outline to help you get there. Applegate Wood Floors is always available to assist you with your decision. Call us today for a Free Estimate!